The Scorpions Youth Volleyball Club provide details on their Learn to Play and Summer Leagues beach program for boys and girls. WireService.ca Press Release (02/01/2018) Cambridge, ON...The Scorpions Volleyball Club, in Cambridge Ontario is proud to announce one element of their multifaceted 2018 youth beach volleyball program. For boys and girls born 2010-2000 they club has a Learn to Play and Summer League programs. 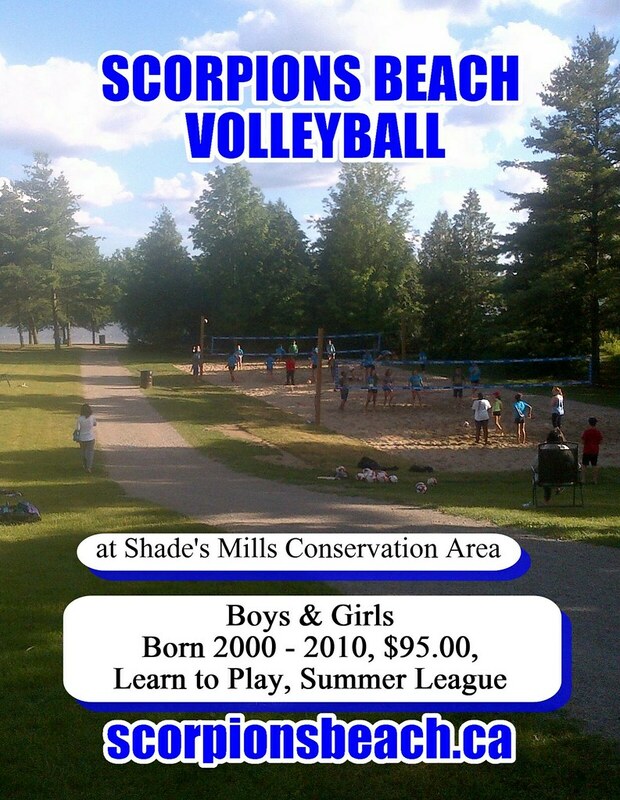 Each program cost $95.00, and includes admission into Shade's Mills Conservation area during your practice/game night. Players receive also a Scorpions Beach T-shirt. Registration also includes entrance into our Giant Grass Volleyball Tournament June 30th Riverside Park Cambridge,ON. More details on that later. We will also be announcing soon, for any parents whose child is in our summer beach programs, a free adult beach volleyball league. Here are the program details: it starts the last week of May and ends the week of July 27th. 2018.